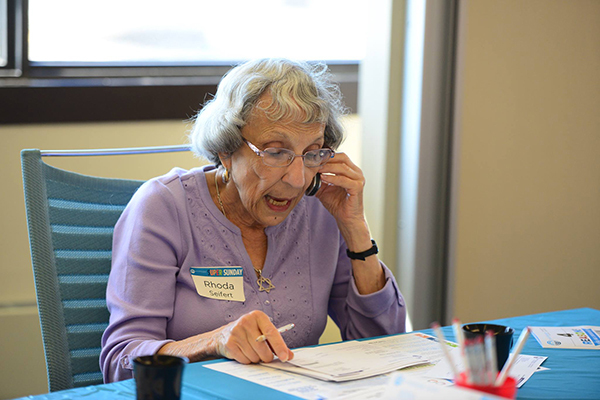 Rhoda Seifert volunteers at the Jewish Federation of Cleveland’s Super Sunday dial-a-thon every year. When Rhoda Seifert was growing up, she heard stories about her family's experiences in the Holocaust. "My father came over from Poland when he was 16 years old," she said. "He came over with an aunt and they were on one of the last boats before the war broke out. Two of his brothers that were still in Poland saw two Nazi cars outside of their home, so they hid in the bushes. They saw the rest of their family shot dead. "So, these stories from my family inspired me to help my community, to help change anyone's thoughts about the Jewish people. The background of the war has pushed me to work." Keeping this in mind, the South Euclid resident volunteers at organizations, including the Jewish Federation of Cleveland, the Red Cross and her synagogue, B'nai Jeshurun Congregation. Seifert: I volunteer with the Red Cross during their blood drives. I also volunteer at the registration desk at B'nai Jeshurun and have sold invitations and Around Town Books for many years. I am the past president and past fundraising president of the sisterhood. I am also the past president and past fundraising president of the Montefiore Auxiliary. I used to knit hats for Israeli soldiers. Now, I'm starting to knit hats and gloves at the Federation for babies. At the Federation, I also volunteer during the Super Sunday dial-a-thon, every day they have it. I even call people from home. Last year, on the last day of calling, I called this person and gave them the pitch. They asked how much I thought they could give - and I suggested a few amounts and they ended up donating $10,000. This year, we were giving matching and tripling donations that went over whatever was given last year. There was a man that had never donated in the past, so he originally declined. I told him about the matching, and he proceeded to donate $150. Also, 20 years ago, I volunteered for the Israel Defense Forces. I was on its largest training base. I volunteered to help around. I told them I would do anything - just don't put me in the kitchen. I have also been to Israel four times. CJN: What is your favorite memory from volunteering? Seifert: Volunteering in the IDF, of course. It doesn't get any better than that. CJN: What inspired you to volunteer for the IDF? Seifert: I'm very much for Israel. When I heard that they took volunteers, I just wanted to do it. How could I not? I always have been and always will be involved with the Jewish community. CJN: How did you become involved with the Red Cross? Seifert: Blood is always so desperately needed. I have Type O negative, which makes me a universal donor. I thought it was a good thing to do, to volunteer for the Red Cross. My first born had a complete blood exchange when he was born, and that also inspired me to help out. Because of that experience, I felt like I just had to. CJN: Why is being involved in the community important? Seifert: I believe so much in Judaism. I hate all the anti-Semitism that is happening. I went to Camp Wise as a kid for many years. So, I think it's good for a community to do, to give us a Jewish background from the start. Thinking of her future, Seifert said she hopes to keep volunteering for as long as she can. "I would love to travel to Israel again, but it's a long trip," she said. "I still would love to put my heart into Jewish causes here. I just think it's very important to do that as a member of the larger community. The current climate is very terrible, and it blows me away to see the hate. Whatever I do positively in my community, it feels like I'm combating that."